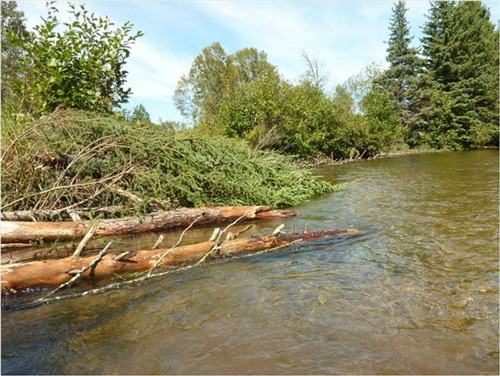 Determine if log structures can improve the aquatic habitat of a river heavy with sediment. Determine if log structures along the riverbank can be a useful technique to improve navigability by deepening portions of the channel impacted by sediment built-up. 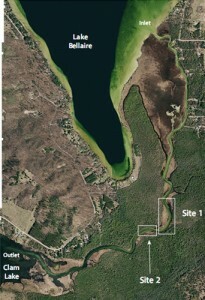 If successful, the log-structures technique could be applied to other sites throughout the Chain of Lakes. The following FAQs will help you understand this project. This flyer (FAQ Brochure) also may be saved for your reference. Natural wooden structures have been placed along the banks of rivers and creeks to improve aquatic habitat. Methods vary, but it means simply placing trees into a river. The trees then provide many types of aquatic habitat, just as if they had fallen into the river naturally. Whole trees or logs that are harvested close to the site where they will be installed, placed and anchored with some simple hardware. After just one year, it’s difficult to identify these structures as man-made—they appear to be natural log jams. In a creek or river with heavy deposits of sediment (most often from human activities), the technique can greatly improve the habitat for fish and their food sources. LWD can convert a river from a relative desert to a lively fishery. Trout Unlimited endorses the concept and has dedicated funding to LWD projects throughout North America. How would LWD help navigation on Grass River? These log structures will reflect some of the flowing water and cause subtle shifts in current direction and velocity. As a result, deeper pockets and channels will form as sediment is scoured from the riverbed around the structures. This should expose gravel beds as well, which will improve habitat. The placement locations of the structures in Grass River are chosen to utilize this natural dynamic and move sediment out of shallow areas, which are impeding navigation. The LWD may reduce the sediment build-up, but it may not. Either way, we installed some excellent fish and fish food habitat. The project includes an important assessment process. We will be documenting the stream conditions before, during, and after installing the structures. By the spring of 2014, we should have a good idea of the effect of the LWD on the river. At that time, we will determine next steps, if any. If the LWD deepens the Grass River channel, where will the sediment go? The river naturally moves sediment downstream. If the LWD deepens the channel, displaced sediment will continue moving down stream. The LWD will be placed upstream from areas where there are relatively strong currents. For this project, we expect there will not be a noticeable amount of newly accumulated sediment in the river. One of the objectives of this project is to measure a “before” and “after” cross-sectional profile of the channel, at the location of and also downstream from the structures. Are there parallel activities to reduce the amount of new sediment entering Grass River? removing accumulated sediment from upstream installed sand traps. Why do the project now? Is there really a problem? There is not a significant navigation “crisis” in Grass River at this time. Nevertheless, concerns about the navigability our waterways has increased in recent years. The issue is the second most common complaint raised by the public to the Drain Commissioner and Operator of Dams. Questions concerning water levels are the most common. These two issues are related, many believe the shallow waterways are due to low lake levels. The root cause of shallow waterways is the accumulation of sediments. The sediments originate from a number of sources and build up in the channels, causing the waterways to widen and become shallow. The problem has been with us for a long time, and older residents recall that the channels were dredged and the spoils deposited on adjacent shores in what were often wetlands. It is now recognized that dredging can be harmful. It promotes river bank erosion and releases excessive amounts of nutrients into the water. Sediment accumulation is well-documented and representative of the whole Chain of Lakes. The necessary technical expertise to assess the project is already focused on Grass River through TLA and GRNA. The interest of a group of civic-minded donors. How will the project be organized? The Antrim County Board of Commissioners (AC) has authorized the Operator of Dams to manage the project. The Operator of Dams will utilize the WWG to assist. The permit from the MDEQ has been submitted with involvement from of the MDNR – Fisheries Division. Further the services of Mr. Ken Reed have been secured to assist. He has installed hundreds of these structures in northern Michigan waters. Cost is estimated at $3500. We have committed $500.